Siramik’s aim is to create a fun and relaxing environment for participants to learn the skills of creating pots on the potter’s wheel that will give you a great sense of achievement. Expert guidance and tuition will help you to produce what you thought had not been possible. Beginners as well as more experienced participants will learn how to advance their skill to a higher level. In the relaxing setting of the spacious studio there are six potter’s wheels (electricity powered) and tools available for each individual. lead them into producing their first pottery. After this initial stage students will have one-to-one tuition to maximise their potential. On the second day, tasks will be set, and the students can produce a piece of work to their own choice. The students can then choose which of their products will be finished off (glazing and firing) at a later stage. This will be sent to them by post. The weekend course will be from Friday evening till Sunday late afternoon and courses are on offer all year round. For partners who come for the weekend but do not take part in the course there will be a range of opportunities available. Historic sites, the Botanic Garden of Wales, leisure facilities, beach and physical activity centers are all within a 20 mile radius from us. 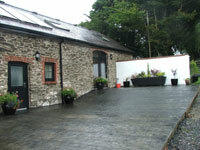 The nearest town, Carmarthen, is a 15 minute drive away. If you would like to come as a group, we can offer courses for a maximum of 6 people. For group prices, please contact us. Mobile: 07866 000326 (preferred) or landline 01559 384292. Trying to find a real unique and individual present for someone? Siramik has gift vouchers for that special person you would like to surprise. They are available for a weekend course or a day’s individual training on the wheel. Please contact us for prices and availability of dates. Bed and breakfast for non-course partners from £ 42.50 per person per night. To confirm your booking a deposit of 20% of the total price is required. The balance of the total should be received one month before the start of the course. When booking less that one month before the course date, full payment is required to secure your place. 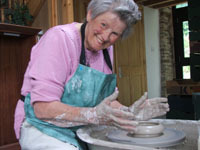 In the potter’s studio courses are available for local communities and individuals. PROMOTION: BOOK HALF DAY (£ 75) OR DAY COURSE (£ 140) AND BRING FRIEND FOR FREE! For more information with regards to which day, time of day and prices please contact us on 07866 000326.